As of 12 Jul 2014, the cumulative number of cases attributed to EVD in the 3 countries stands at 964, including 603 deaths. The World Health Organization (WHO) continues to closely monitor the evolving Ebola virus disease (EVD) outbreak in Guinea, Liberia, and Sierra Leone. The current epidemic trend in Sierra Leone and Liberia remains serious, with high numbers of new cases and deaths being reported. Between 8-12 Jul 2014, 79 new cases and 65 deaths were reported from Liberia and Sierra Leone. In Liberia, 30 new cases and 13 deaths were reported, while in Sierra Leone, 49 new cases and 52 deaths have been reported. These include suspect, probable and laboratory-confirmed cases. This trend indicates that a high level of transmission of the ebolavirus continues to take place in the community. The epidemic situation in Guinea is being closely observed, with 6 new cases and 3 deaths reported between 8-12 Jul 2014. The respective Ministries of Health are working with WHO and partners to step up outbreak containment measures. WHO is currently supporting the affected countries to strengthen contact tracing, as one of the most effective outbreak containment measures. Early detection and prompt isolation of new EVD cases is requisite for interrupting secondary transmission of ebolavirus in the community. Therefore, WHO supported the Ministry of Health and Social Welfare (MoHSW) of Liberia to identify and train 107 community volunteers and 33 supervisors. In Sierra Leone, a total of 296 community volunteers have been trained. The trained volunteers have been deployed in the affected communities to conduct contact tracing and ensure immediate evacuation of suspected EVD cases from the community. In response to a request from MoHSW Liberia, WHO, with support from the government of the USA, has supplied personal protective equipment (PPE) and other medical supplies to Liberia in order to ensure the safety of health-care workers in their response efforts. This donation, which was handed over to MoHSW Liberia on 26 Jun and 3 Jul 2014, included PPE appropriate for use by both clinical care and burial teams. On 14 Jul 2014, additional supplies, including backpack sprayers and hand sprayers for disinfection as well disposal bags for biohazard wastes, were delivered to the country. New cases and deaths attributable to EVD continue to be reported by the Ministries of Health in the 3 West African countries of Guinea, Liberia, and Sierra Leone. Between 8-12 Jul 2014, 85 new cases of EVD, including 68 new deaths, were reported from the 3 countries as follows: Guinea, 6 new cases and 3 deaths; Liberia, 30 new cases with 13 deaths; and Sierra Leone, 49 new cases and 52 deaths. These numbers include laboratory-confirmed, probable, and suspect cases and deaths of EVD. – Sierra Leone, 386 cases (339 confirmed, 37 probable, and 10 suspected) and 194 deaths (151 confirmed, 38 probable, and 5 suspected). *New cases were reported between 8 and 12 Jul 2014. As of 11 Jul 2014, a total of 23 samples were received by the laboratory: Kailahun (9), Kenema (11), Bo (1) and Western Area (2). 10 of the 23 samples are laboratory confirmed positive for ebolavirus from Kailahun (7) and Kenema (3); 6 of the remaining samples are negative while 7 results are pending. – Outreach team and skilled response personnel. The number of the latter has dramatically increased since the beginning of the week (i.e., 300 volunteers trained and operational on the ground since 10 Jul 2014); also psychologists (Red Cross, MSF) join the team and actively participate in response activities in the field. – Support for the children (orphan and sick) — Save the Children and World Food Program out of many others needed to support ongoing actions/plans. Fri 11 Jul 2014: WHO Geneva “Ebola Outbreak Response Laboratory” conference call: Coordinate the results, quality control (panels of test), cross referencing in country (i.e., Kenema MOHS-Metabiota lab (permanent lab in Kenema) with WHO-Public Health Agency Canada (mobile lab in Kailahun). As of 12 Jul 2014: 650 patients (initially VHF suspect/probable cases) have been tested. As of 11 Jul 2014, 225 confirmed EVD positive cases. All other cases have therefore been re-classified as negative/non EVD cases (most of them with concurrent infections). – Strong connection/synergy exists now between the 2 laboratories covering the Ebola outbreak in Sierra Leone (diagnostic and follow-up of the patients), including the WHO Public Health Agency Canada (PHAC) in Kailahun (Dr. Garry Kobinger) and the MOHS-Metabiota Laboratory at KGH in Kenema (Dr. Nadia Wauquier — Metabiota, Matthew Voorhees — USAMRIID). Challenges: For indeterminate samples (i.e., samples antigen negative, PCR positive high-CT positive). Cross-referencing with OMS-PHAC [WHO PHAC] will give definitive results and may also require clinical intervention (i.e., professional opinion of doctor on duty). Multiple retests are costly in both reagents and effort. “To be frank, I am actually scared. I am a father of 6 and I don’t want to die and leave my children behind now. And so I have decided to stay at home with the family for now. When things improve, I will get back to my job,” said a laboratory technician who also spoke to IRIN on condition of anonymity. “I am afraid to die. Our friends died and their families did not receive any compensation from the government. It means that if I die too that will be the end. I am very scared and have decided to stay home,” said a nurse from Redemption Hospital, a referral hospital in Monrovia. Panicked and shocked Liberian health workers who have seen their colleagues die of Ebola virus disease (EVD), which has killed more than 500 people in West Africa since January 2014, are abandoning their work stations, hoping to resume only when the disease subsides. Their frustrations have been compounded by the lack of adequate medical equipment. Those who remain at work face a heavier workload. The authorities say they are conducting training and supplying equipment to bolster EVD control. “We are just managing by the grace of God. We are very scared because if you tell us to fight Ebola or prevent it, what materials do we use? None of us has been trained to fight the disease,” Kerkulah told IRIN. The Dolo health centre recently lost a doctor and a nurse to EVD, which had killed 539 people and infected 888 in Liberia and in neighbouring Guinea and Sierra Leone by 8 Jul 2014, according to the World Health Organization (WHO). 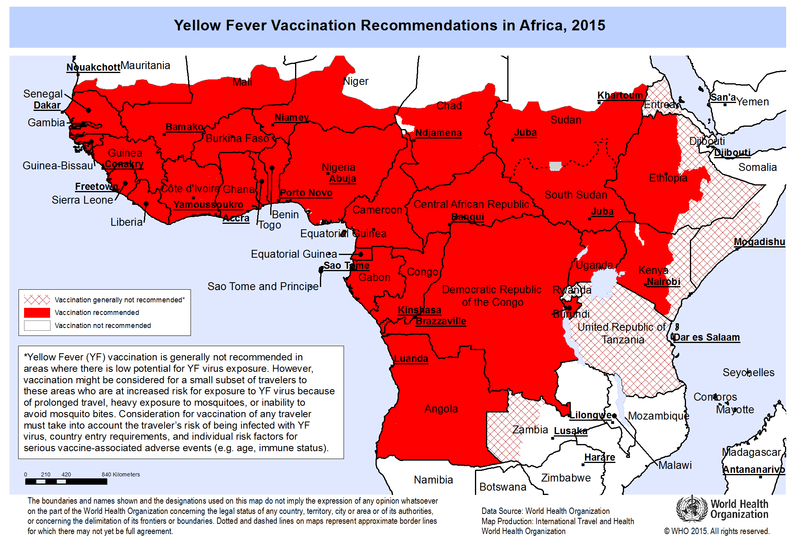 EVD’s spread is mainly being driven by some cultural practices among rural communities such as burial rituals, high population density around the capitals of the 3 West African countries, as well as cross-border movement, WHO said. Larry King, head of Mamba Karba Health Centre on the outskirts of the capital, said 9 of the centre’s 25 staff have stayed away. “The workload here is heavy. My workers have refused to come to work since they heard the news of the death of some of their fellow nurses. This is causing a serious hindrance to the operation of the centre. There are more patients coming in with other illnesses but the manpower is low. I hope the nurses can see the reason to come back to work,” he said. The Health Ministry says it is carrying out training and providing supplies to health centres in a bid to calm fears and boost control of the incurable disease. In Liberia, 88 people have died of Ebola and there are 142 confirmed, probable or suspected cases, according to WHO. Some 200 health centres have received training out of a total target of 500, said Nyenswah. “The problem the health workers were faced with was the lack of training and lack of knowledge of the ebolavirus,” he explained. “As you know it is a strange virus in our region. So right now there is a robust training team that is moving to health facilities in both urban and rural Liberia to provide these trainings and protective materials. So once they have the training and information we are assured that the fear will be put aside and that they can take care of the patients. Last week, leaders of the Economic Community of West African States (ECOWAS) agreed at a meeting in Ghana to set up a fund to deal with the spread of the EVD in the sub-region. Many people show unconcerned when it comes to the discussion of disease outbreaks in Ghana; thinking that the Ministry of Health [MOH] and Ghana Health Service [GHS] owe the responsibility to curb the disease. This attitude has precipitated the cause of disease outbreaks in Africa and particularly in Ghana. The earlier we change this attitude, the better we can control diseases to the extent of not even causing outbreaks. Currently, Ghana, due to her international territories, is imminent for the Ebola disease outbreak — and cities, including Techiman [Brong-Ahafo region], where there is an African market that serves the whole West Africa. Due to the influx of people from all walks of life to the Techiman market, Ebola virus disease is likely to occur in Techiman if preventative measures are not taken. It would be important that all meaningful Ghanaians join the advocacy against the Ebola virus. In addition to the MOH/GHS, the media should also in their reportage slot in awareness of the Ebola disease to their listeners. Nana nom and their subjects should also mention Ebola disease in their discussion to protect the people they reign. Bankers and GPRTU [Ghana Private Road Transport Union] should also do well in the awareness of the Ebola virus disease to protect their customers to be healthy to continue banking with them. They are very important in the sense that people overcrowd and spend several hours before they would be served. While waiting, people will definitely sneeze and cough. Due to the air-conditioned hall they use, the air in the banking hall and the air-conditioned buses that travel with long hours are potential sources that people can get this disease and the campaign against Ebola virus disease should be a concern for all these institutions. [Airborne transmission of ebolaviruses between humans has never been proved, but close skin contact in overcrowded conditions could increase the risk. The Ministry of Health is “extremely disappointed” with a World Health Organisation (WHO) official’s contention that Zambia is not adequately prepared to handle the deadly Ebola virus disease [EVD]. Director of disease prevention and control at the regional office for Africa Dr Francis Kasolo, a specialist in virology and based at the WHO regional office in Congo Brazzaville, said during a discussion hosted by the Press Freedom Committee of the Post on Saturday [12 Jul 2014] that Zambia is not adequately prepared to handle Ebola in an event of an outbreak. Minister of Health Joseph Kasonde said at a media briefing in Lusaka yesterday [13 Jul 2014] that statements made by Dr Kasolo are misleading. Dr Kasonde said the Ministry of Health was not consulted, and contrary to Dr Kasolo’s assertions, Government has put adequate measures [in place] to contain EVD, a lethal viral disease which kills up to 90 percent of those who contract it. “The Ministry of Health has taken all necessary precautions and continues to take all necessary precautions. There is therefore no reason for apprehension or panic,” the minister said. He was flanked by WHO country representative Olusegun Ayorinde Babaniyi. Dr Kasonde said the Ministry of Health has constituted a team which has already conducted training and awareness at all the major ports of entry, including international airports such as Kenneth Kaunda, Simon Mwansa Kapwepwe, Harry Mwanga Nkumbula and Mfuwe. He said personal protective equipment has also been procured and all provincial medical personnel are on high alert. “I would like to inform the nation that while there is no immediate threat to Zambia, and Zambia in its history has never recorded a case of EVD, the Ministry of Health continues to be vigilant and has put in place measures to mitigate the threat should it occur,” Dr Kasonde said. He said his ministry is perturbed at Dr Kasolo’s sentiments because they are misleading. “Government takes any comment from WHO very seriously and Dr Kasolo’s comments were not relevant to the happenings on the ground,” Dr Kasonde said. The news keeps getting worse for the West African countries that are suffering from Ebola virus disease [EVD] outbreaks. International health officials are still experiencing trouble in halting the spread of cases, and now Ivory Coast has turned away 400 refugees, who recently fled [back] to Liberia. According to the World Health Organization, the death tolls in Guinea, Liberia, and Sierra Leone reached 603 after 85 new cases and 68 deaths were documented in between 8-12 Jul 2014. Sierra Leone experienced the worst conditions over that 5-day span, reporting 49 new cases and 52 deaths [now a total of 964, including 603 deaths — see WHO update in  above]. Despite the lower numbers for Guinea, the West African country has experienced the worst of the situation, amassing 406 cases and 304 deaths since the outbreaks began in February 2014. Similarly, Senegal closed their border that neighbors Guinea back in March 2014 when it was reported that the ebolavirus killed 70 people and began spreading to Guinea’s capital, Conakry. They also canceled a weekly market that took place in the southern region of Kolda, which is an important node of commerce, attracting thousands of people who trade and purchase various goods. Senegal reopened the border on 6 Mar 2014. It’s unknown if the United Nations will step in and take action on the issue, but for now Ivory Coast is holding firm in order to avoid an EVD outbreak in their country after they’ve avoided it for so long. [ProMED has heard from a reliable source that the American who died in Ghana from suspected EVD finally tested negative for ebolavirus.